Bells of Lazonby is one of the most iconic family businesses in Cumbria – and similarly to Booths has always been committed to its people, place and great tasting products. 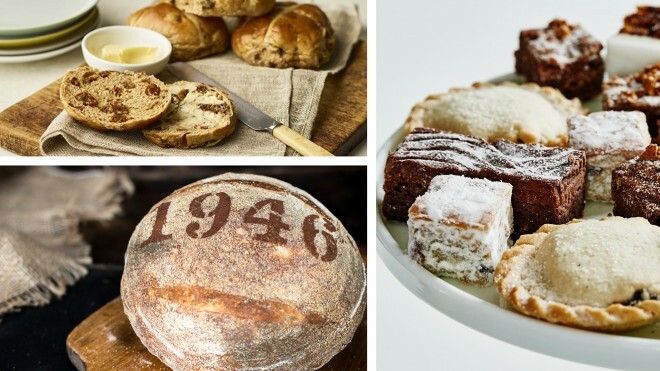 Established in 1946, the family bakery business was founded by John Bell – a man of fighting spirit who made it through WW2 after his aircraft was shot down over Germany. Upon his return, he moved to Lazonby with his family and set up a small bakery and shop, attached to their home to provide an income for his family. There is a strong marriage between Bells and Booths – both carrying engrained values of high quality, family and provenance – indeed even Michael Bell (son of the founder – John Bell) met his wife at a Booths event and over the past 30 years, both relationships have flourished into a wonderful pairing. Bells have a habit of building band wagons, instead of jumping on them and have always innovated ahead of the curve. Most recently, Christmas products have carried that special edge, using edible glitter in recipes, as well as developing a bespoke Christmas tree lidded mince pie, baked and supplied fresh every day to all stores during the Christmas period. At Easter, they design and bake endless flavours of delicious hot cross buns including Belgian Chocolate and Fudge, as well as Apple & Cinnamon. In recent years, they have continually developed their signature range of artisan sourdoughs – all hand-crafted by an in-house team of talented artisan bakers who use a 3-day long fermentation process, hand mould and stencil each one individually, before baking to perfection. They bagged themselves a finalist position at the National Baking Industry Awards last year in the Customer Focus category for their development of this sourdough range in line with our customer needs and desires…as well as winning an award specifically for their prestigious Lazonby Loaf on a global platform at the World Bread Awards.